Hailing form a renowned family of outstanding professional wrestlers, Babita is an Indian female wrestler, who has asserted her dominance in the sport. She is reckoned amongst the most-recognised young women achievers of the country and likes to talk about women empowerment and breaking societal constructs to emerge as winners. Babita earned several medals and brought laurels to the Indian female wrestling community. She won gold medals in 2014, 2011 and 2009 Commonwealth Games and a silver medal in the 2010 Commonwealth Games. 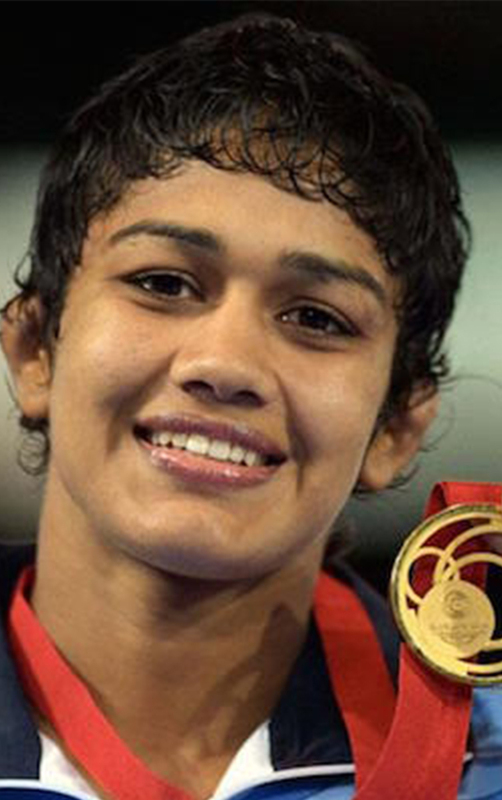 She also secured bronze medals in the 2013 Asian Wrestling Championship and the 2012 World Wrestling Championship. Babita is the younger sister of Geeta Phogat, India’s first gold medalist in wrestling at the Commonwealth Games. Her father Mahavir Singh Phogat was a widely admired wrestler himself and a receipient of the Dronacharya Award. A man who always stayed ahead of his times, he encouraged and trained his daughters to become wrestlers, breaking all stereotypes. The incredible story of this family was depicted on the silver screen in the critically acclaimed film – “Dangal”.